TO BE PART OF THIS LIFE-CHANGING EVENT, FILL OUT THIS FORM. Tell me about your dog and what you'd like to accomplish - if you care to. > OR YOU CAN PAY AT THE DOOR, BUT ONLY WITH CASH OR CHECK (no Debit or Credit Cards can be used when paying at the door!) For Nov 17th, 2018 12 Noon to 4 PM You can Give this as a Gift! just put the name of the person who is attending. You can purchase more than one ticket. I will get notice of your Payment and will know that you paid. You can also print-out the Receipt that will be shown. When you Click Here, You will be able to Pay with Credit or Debit Card if you want! and you do NOT have to have a PayPal account (PayPal will not spam you or force you to make an account) If you Pay at the Door, it has to be Cash or Check. Introductions: Who I am & how I learned what I’m going to share with you. What does “Woman to Wolf” mean? It means a lot! You (the woman) relating to your Dog (the Wolf). You developing your Alpha She-Wolf Pack Leader persona. Your Wolf teaching you Ancient Wisdom. 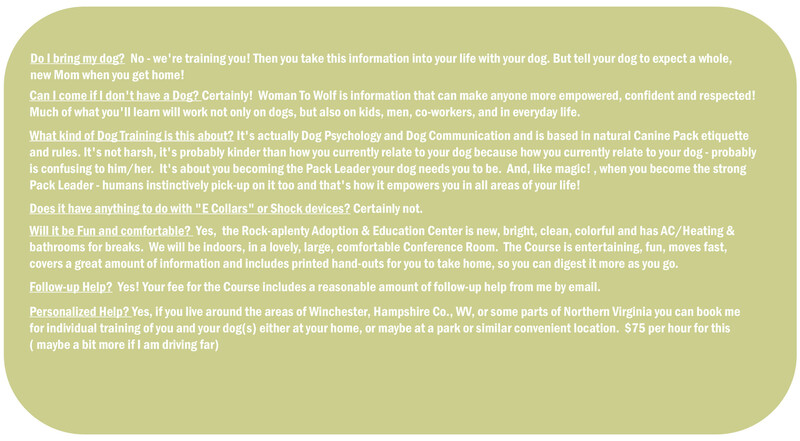 “Dog Training” without my Dog? How’s that work? When people have trouble with their dogs, such as Pulling you on Walks, Hyperactivity, Not Getting Along with Other Dogs, Fear of things (men, other dogs, noises, etc. ), Aggression, Separation Anxiety, Jumping on People, Biting – the Solution starts with You, the Dog Parent. In most cases, it’s completely addressed by Training the Human. True Power and why it’s yours to claim. Calm Assertiveness is true Power, Brute force is not, and Calm assertiveness is what we practice in Dog Psychology. Becoming a Strong Pack Leader does SO many other good things for us; Empowerment really helps with mothering humans kids, it’s gets us more respect from others, and more respect for ourselves. It’s a very healthy thing. My Goal in Dog Training is: to make the dog be a successful family member, so that you do not give-up on the dog – ever. Because, if you place her with another home, or in a shelter, she would probably end-up killed. In the U.S. EVERY DAY 5,000 dogs are killed in over-crowded Shelters.. And if you can’t deal with your dog’s issues, the next people won’t either and she would end-up in a shelter. Dogs have a lot to teach us! The great part is… It’s worth your time & effort because it can change your life. This system of training is very good information for all of Life! It instills confidence into you that you will use in many of other ways … not just with dogs. It’s about you being In Charge. You being The Leader. You insisting on Respect, and lots more. If you put into practice what I will share with you, then you can expect improvement in all relationships you may have: kids, spouse, men, bosses, relatives, in-laws, neighbors and random people you meet in life. Becoming the Empowered She-Wolf – Leader of Your Pack. The Stance: Daenerys, Morgaine, Oprah, Cleopatra and you. The Voice: What’s your sound? R E S P E C T: find-out what it means. Why so many messed-up dogs? Lack of Bio-Mom & Puppy Factories. Wolves and exercise, breeding, out-of-work dogs, lifestyle, etc. Chronic niceness – How’s that working for you? We communicate with our dogs in a “language” that we don’t even know exists! No wonder we’re getting results we don’t want – we’re communicating the wrong things! It’s a strange thing. You are “speaking a language” to your dog. But you don’t even know you are. And you don’t even know the language exists! and you don’t know what means what in that language! But you’re doing it – so, you often are “saying” the wrong thing. It is a language made-up of Body language, Posture, Positioning, Tone of Voice, Volume of Voice, Excitement or Calmness of Voice, your Mood, your Nervousness/Excitement/Calmness level, your Ability to Project yourself as “The Boss”, or You Projecting Yourself as “sweet/soft/nice-no-matter-what/ and lacking power” .. and even your Thoughts are communicated to your dog because… Dogs are, basically, psychic! Dog’s are “speaking a language” that we do not understand, too! Dog’s Body Language: Ears, tail, mouth, teeth, hackles, stance, position, motions, sounds and more. Rewards: Many things can be a Reward and it changes on a minute by minute basis sometimes. We use what is available at the moment and we use what the dogs wants at that particular moment. We do not reward bad behavior! But, you probably are! Without knowing it. Consequences: It’s a Law of Nature that bad behavior may have an undesirable consequence; it’s not cruel, it’s not “bad”, it’s a crucial part of living and it keep us, and dogs, from danger and harm. Silence is your best friend: What you are (inadvertently) doing to rile-up your dog and what to do to calm your dog. Now We’re Ready To Start Learning some Dog Training Techniques! Now We’re Ready To Start Learning More Dog Training Techniques! Equipment: Collars, Leashes, Harnesses, etc. Specific Problems, Questions & Issues that Class-Members have requested I cover. ​ETHICAL RESPONSIBILITIES:Facts we All Need to Know: Shelters, baiters, bunchers, fighting breeds, etc.